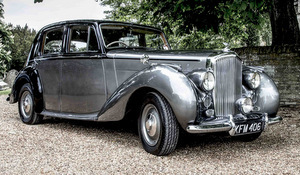 This is Grace our beautiful 1949 Mark VI Bentley, finished in traditional colour scheme of Black over Tudor grey. With a classic shape she is a real head turner, people cannot help but stop and stare. Fresh from a complete internal leather rennovation to as left the factory condition, she looks and smells amazing. If you've met us at a wedding fair or visited our base then you may have already met Sebestien the Bear. When we purchased Grace from the previous owners, a deal was struck where the only circumstances the owners would allow the car to leave them after 28 years ownership, was if Sebestien (their now adult son's bear) stayed with the car. As their son had been four when they acquired the car, the bear had been a traveller in the car for all of the years they had owned the car. How could we possibly refuse? So Sebestien joined us for the 175 mile journey to his new home, to take on his new role as chauffeur. Mr B is a Mulliner bodied Alvis Fourteen four door sports saloon in stunning red and black livery. Unusually a Mr rather than a Miss due to the coincidental number plate, Mr B is a comfortable classic lovingly maintained and ready to serve. The TA 14 was the first car to be produced by Alvis cars after World War II. A remarkable British Car! Available for hire as a wedding car or additional transport for your bridal or groom party. The Daimler Double Six is a super car disguised as a chauffeured limousine. With its Six Litre V12 engine (capable of producing 318bhp and limited to 155mph) it can be a gentle giant or a roaring big cat. While technically five years away from classic status, from our research we believe there are less than ten on the road in the UK, so this is a far rarer sight than many true classics. The Daimler brand represented the highest trim level of the Jaguar XJ40's, this is obvious when you see the internal finish. She is covered in cream leather with red piping and all of the mod cons that you expect from a modern car despite her vintage. 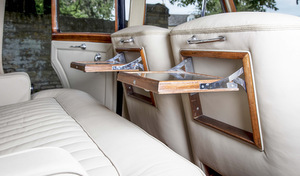 Our chauffeur driven vehicles will have a beautiful silk flower decoration on the rear parcel shelf and will be trimmed with ribbons to match the colour scheme of the day. We also have a modern 7-seater vehicle available for hire should you wish to transport larger wedding parties in addition to the bridal party or where the distance between your venues is too great for your main car to perform multiple trips. The vehicles we offer will always be British marques assembled in the UK, or have a significant link to British culture. The owner has a particular interest in Bentleys and Rolls Royces manufactured in the Crewe factory between 1945 and early 1960's. 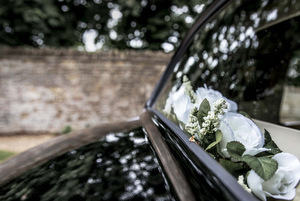 We don't believe in respraying cars to the norm of white or cream as we, (and your event photographer) know that in darker shades, these cars provide a stunning contrast to white and ivory wedding dresses. 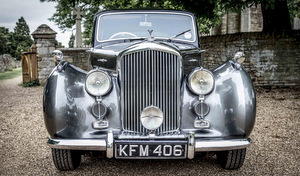 Although vehicles manufactured before 1960 are no longer required to have an MOT, we strongly believe that the MOT ensures that our vehicles are safe to transport you on your special day. All of our vehicles will always be maintained to modern safety standards and MOT tested annually. We will take every possible precaution to ensure your day goes perfectly to plan, but we recognise that it is better to be safe than let down. As a result all our vehicles are insured for both 'business' and 'for hire' use and have appropriate breakdown cover. In addition Nene Valley Weddings has both Public Liability and Employee Liability insurance. It's our intention to never need any of these precautions, but we want your day to be perfect and believe that you can never be to prepared. Copyright (c) 2018 NeneValleyWeddings.co.uk All rights reserved.